The following is a repost of an article I wrote for The Urbanist in February 2014, about six months before launching Seattle in Progress. In it I warn that Seattle is heading down the path of San Francisco, which by some measures is now the nation’s most expensive city for new renters. I argue that the tech industry—the industry in which I have always worked—has an obligation to push for more housing, more affordable housing, and an end to homelessness. With the launch today of the Seattle in Progress Blog, it seems appropriate to start with why I think this work is important. Original article here: Why Tech Workers Should Care About Housing Issues. Technology industry works are not apathetic. The industry is known for its passionate defense of civil liberties, the unprecedented scope of the philanthropy of its most successful members (and not just Bill Gates–Mark Zuckerberg of Facebook, Pierre Omidyar of Ebay and Sergey Brin of Google were all amongst the top 10 philanthropists in the US last year), and growing movements in both education and immigration reform. Working in such a transformative industry naturally leads people to think and care deeply about societal issues. But I suspect most tech works have hardly given a moment’s thought to housing issues. That needs to change. The history of the technology industry was mostly written in the suburbs, whether in Silicon Valley or Redmond. But today tech companies and tech workers are increasingly choosing to locate in city centers. In San Francisco the arrival of Twitter has brought an influx of tech companies downtown, while here in Seattle, Amazon has completely transformed South Lake Union. Given the large and ever-accelerating size of the tech sector, these companies and their employees are increasingly shaping the character and policies of the cities. That gives the tech industry a responsibility for engaging constructively on housing issues, which are so central to life in a city. For a sense of urgency, look to San Francisco, the obvious example what happens when a tech boom combines with failed housing policy. If you haven’t been following the growing hostilities of the last few months, here’s a quick summary of the conflict unfolding there. New residents have been flooding into San Francisco during the latest tech bubble, while construction of new housing continues its decades-long stagnation (see Gabriel Metcalf’s piece in The Atlantic Cities for a great summary). Predictably, already high rents have skyrocketed. Rightly or wrongly, the tech workers have been cast as the villain in all this. Protests against evictions, rising rents and gentrification have become so frequent that they’re making national news. 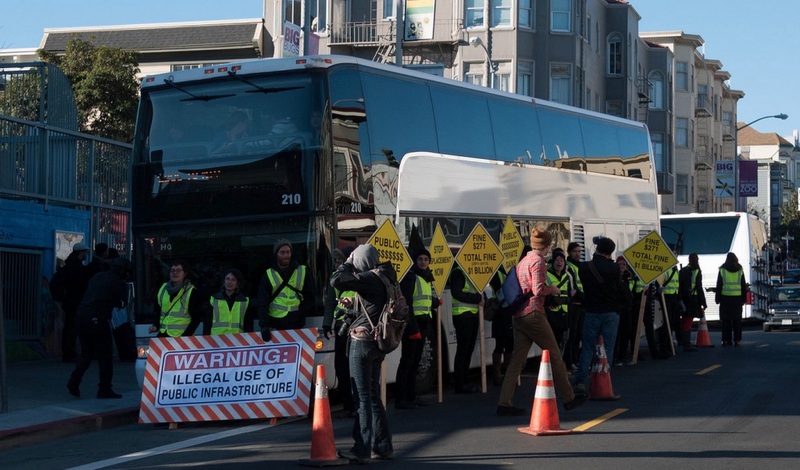 The improbably lightning rod for these protests has been the company buses that ferry tech workers each day to campuses south of the city. In a sense the protesters are right to blame tech workers for rising rents: with its severely limited housing stock, wealthy tech workers are directly competing with the poorer residents for the few available apartments. But in another sense the blame is misplaced: had San Francisco built housing to keep up with demand then there wouldn’t be ever more people fighting over the same limited housing stock. This is why the tech industry should be pushing hard for more density: because without it, their workers really are pushing out the poor. The tech industry should be a powerful voice for more housing, more affordable housing and an end to homelessness. But unfortunately, the message from the tech community that’s gotten the most attention is ex-CEO of AngelHack Greg Gopman’s rightfully reviled rant against the poor. Gopman’s contention that the poor should be forcibly removed so as not to bother the rich reads as almost too movie-villain evil to be real. But sadly, he has become the public face of the tech industry for many. Being seen as the enemy will have real consequences for the tech workers. Companies like Twitter and Amazon are able to locate in downtown cores because city leaders have welcomed them. If public sentiment turns against them, as it has in San Francisco, tech companies will surely find it more difficult work in downtown cores. And the new construction that houses so many tech workers in city centers will only continue if the public is convinced that density and growth is good for the city as a whole. Seattle is thankfully in a far better position than San Francisco. We’ve continually added to the housing supply, keeping rental prices from rising as rapidly as they have in San Francisco. But debates about growth, density and affordability are far from settled. The tech industry in Seattle should heed San Francisco’s warning and get involved now. For their own good and the good of the city, tech workers should stand up to demand enough housing for everyone who wants to live here.